Welcome to the start of our traditional living room makeover! This is the first week in our 6-week One Room Challenge journey – over the next month we’ll be transforming my in-laws’ living room into a beautiful retreat! I can’t believe it’s time for another season of the One Room Challenge! I’m so excited!! This is by-far one of my favorite events to participate in as a designer. 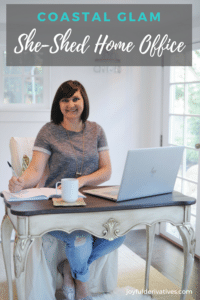 If this is the first you’ve heard of the ORC, I am honored to introduce you to a fabulous bi-annual event for interior design bloggers and influencers! It happens every April and October, and is hosted by Linda at Calling it Home in conjunction with her media sponsor which is Better Homes & Gardens this season. During the 6-week season, designers from all over come together to support each other as we all work our way through a room makeover! There are 20 featured designers, as well as over a hundred guest participants (including me!) who link up their makeovers and cheer each other on. This is our third season as guest participants (last fall we did our master bathroom and last spring we did our dining room) and this season we’re tackling my in-laws’ living room! I can’t wait to take you along over the next six weeks as we transform their builder-grade space into a sophisticated, stylish room. 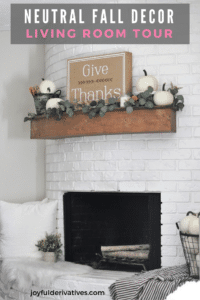 Before I dive into the “what” of this makeover, I want to spend a minute explaining the “why.” When my husband and I were brainstorming what room we wanted to tackle for our next ORC, we both felt called to bless his parents with a room makeover. My in-laws are honestly some of the most deserving people I know. My mother-in-law is truly gifted with children. She’s always serving the children in our community in some capacity – whether it’s through foster care, children’s ministry at the church, daycare in her home or business. This couple has had seasons with over 10 foster children living under their roof! I am continually blown away by their humility and hearts for serving others. My children have been going to my mother-in-law’s in-home daycare since they were born and about 18 months ago, their prior home’s HOA started bullying them about the daycare. As a result, they were forced to buy a new home quickly in order to move their in-home daycare out of the HOA. They’ve lived in this home for about a year now, and it has a lot of potential, but with the transition to two houses (one for the daycare and one for them to live in) their time and resources have not been available for renovations. Ok, you ready to see the space?? The front door to the home opens into a “faux foyer” with stairs and a closet to the right and the living room to the left. When you walk into the door, you’re presented with a wall and a small opening into the living room. Straight ahead (where the wall separates the living room from the entry/hallway area) is a really awkward space to furnish. The living room itself is rather large (15′ x 19′) but the furniture they brought from their prior home just isn’t the right size for the space. 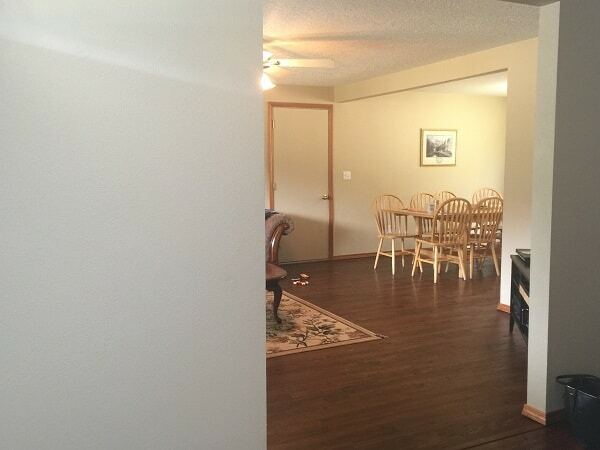 From this angle you can see the stairwell and closet tucked into the corner separated from the living room. 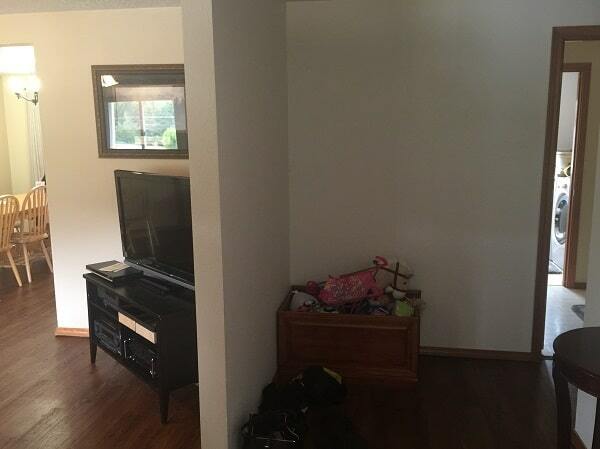 Ok, now that we’ve seen the space, let’s talk through the characteristics of the room that my parents want to change. I mean, the purpose of our traditional living room makeover is to fix all of them, right?! Too dark – the windows on that front wall are underneath a covered porch, limiting the natural light that flows into the room. Ugly ceiling fan – they don’t need or want it! 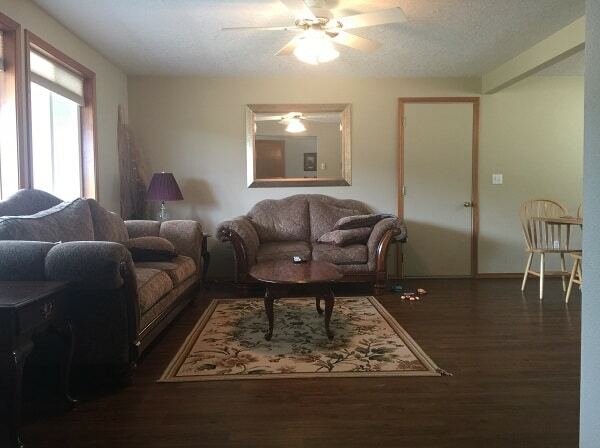 No fireplace – they really miss the coziness of a fireplace in the living room. 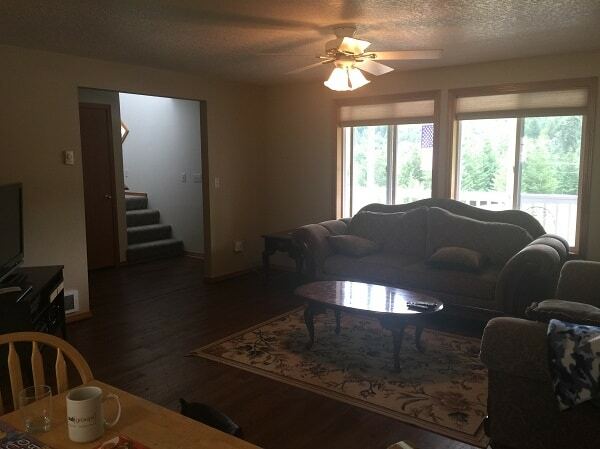 Floor trim gap – the prior home owners replaced the carpet with luxury vinyl, but didn’t lower the base trim so there’s a 1/2″ gap between the flooring and trim! Wood trim and flat doors – they are fans of white trim and six panel doors. Sounds like some fun items to fix, don’t you think? The design we’ve come up with is fantastic – I can’t wait to walk you through its transformation over the next 6 weeks! I also wanted to take a minute to introduce you to FrogTape, our official sponsor this season! Be sure to head over and read about their innovative painting tape – it is seriously AMAZING. I mean, talk about perfect lines! And if you’re doing a painting project that requires taping, grab a roll of FrogTape – trust me, you’ll never use any other brand of painting tape again. We use their tape all the time! I hope you follow along the rest of the season as we work through this much-needed traditional living room makeover! It’s going to be such a fun project!! And if you love these types of makeover projects as much as I do, then you’re going to want to go over and see what rooms the featured designers and guest participants chose too! I will be following along! Best of luck!